The FTD® Color Your Night With Intrigue™ Bouquet is a sweet and romantic flower arrangement set to sweep your special someone off of their feet with its flowering beauty. Rich red roses, red gerbera daisies, plum mini carnations, lavender traditional daisies and lush greens are brought together to create an unforgettable flower bouquet. 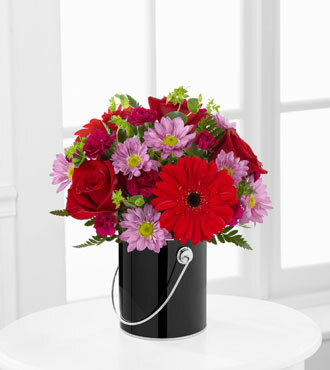 Presented in a black paint can inspired container, this mixed bouquet will be the perfect gift to send on their birthday, for an anniversary, as a way to convey your love and affection, or in celebration of Valentine's Day. GOOD bouquet includes 10 stems. Approx. 11"H x 10"W. BETTER bouquet includes 15 stems. Approx. 12"H x 11"W. BEST bouquet includes 20 stems. Approx. 13"H x 12"W.